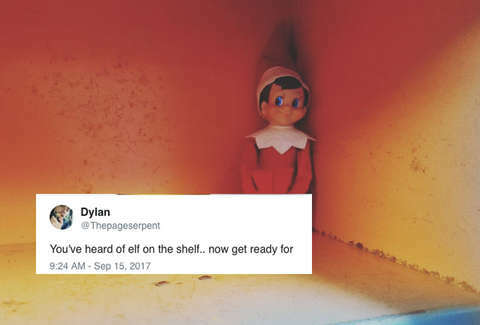 Somehow that creepy, holiday-themed way to spy on the kids, Elf on the Shelf, has spawned an absurd meme. Any meme based on Elf on the Shelf would probably have to be absurd, but this one has a special batshit je ne sais quoi. Most memes surface for a reason. They have some kind of logic to them. This time, you can pretty much skip all of that. This meme only asks that you place one thing on another thing and make them rhyme. You know, like Elf on the Shelf. Easy enough. Morty on the Forty. It's just rhyming. That's it. Don't get too clever. Put that Mo Rocca on the Maraca away. Despite, or likely because of, its simplicity, the meme went viral and flooded timelines with ridiculous rhymes. The meme raises a good point. This is basically how Elf on the Shelf had to be named, right? Spying on your kids is a year-round activity. Why an elf? Why a shelf? Couldn't it as easily be on the ceiling or entertainment center or chifforobe? Rhymes. That's why. Rhymes.